How cool is this? 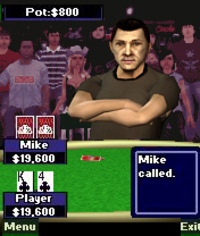 You can play Texas Hold'em Style Poker Against Expert Players on your Cell Phone. Verizon Wireless, Abandon Mobile and NBC Sports announced today that NBC Sports Heads-Up Poker mobile game will be available exclusively to Verizon Wireless Get it Now® customers through May 31, 2006. The mobile game, NBC Sports Heads-Up Poker, will be promoted on-screen during the 2006 Championship from Caesars Palace in Las Vegas that is scheduled to air nationwide on NBC Sports April 16, 23 and 30 and on May 7 and 14. All television coverage begins at noon EDT; the two-hour championship telecast will take place at 1:00 p.m. EDT on May 21. Based on the popular card game Texas Hold’em, NBC Sports Heads-Up Poker brings all the excitement of the National Heads-Up Poker Championship to Verizon Wireless Get It Now customers. With NBC Sports Heads-Up Poker mobile game, there’s no need to put on a poker face as players go one-on-one against the world’s best in a single elimination competition in tournament mode, or play one game with an opponent of their choosing. In Texas Hold’em mode, players can also challenge all of the opponents at one table for a game in Texas Hold’em format. The National Heads-Up Poker Championship features the world’s best players in single elimination competition for $1.5 million in prize money. Competitors include defending champion Phil Hellmuth, Johnny Chan, Doyle Brunson, Howard Lederer, Ted Forrest, and Chris “Jesus” Ferguson among virtually all of professional poker’s big name players. The high-quality graphics and animation provide spectacular gameplay on a variety of Verizon Wireless Get It Now-enabled handsets, and the simple interface and competitive AI reflect all kinds of different poker playing styles. Verizon Wireless Get It Now customers can find NBC Sports Heads-Up Poker in the What’s New shopping aisle of the Get It Now virtual store on more than 30 handsets for $2.99 monthly access or $7.49 for unlimited use purchase. Download charges for Get It Now applications vary and airtime charges apply when browsing, downloading and using certain applications. Customers need a Get It Now-enabled phone and Verizon Wireless digital service to access the Get It Now virtual store. For more information about Verizon Wireless products and services, visit a Verizon Wireless Communications Store, call 1-800-2 JOIN IN or go to www.verizonwireless.com. I don't know if you play online poker on a regular basis but I have some (hopefully) helpful advice if you do. Please do leave a comment, your opinion on the site and if my info was useful! this games looks so cool. i will have to get it.